Peter the Great, Peter I or Pyotr Alexeyevich (Russian: Пётр Алексе́евич, Пётр I, Pyotr I, or Пётр Вели́кий, Pyotr Velikiy) (9 June [O.S. 30 May] 1672 – 8 February [O.S. 28 January] 1725)[lower-alpha 1] ruled the Tsardom of Russia and later the Russian Empire from 7 May [O.S. 27 April] 1682 until his death, jointly ruling before 1696 with his half-brother. In numerous successful wars he expanded the Tsardom into a huge empire that became a major European power. According to historian James Cracraft, he led a cultural revolution that replaced the traditionalist and medieval social and political system with a modern, scientific, Europe-oriented, and rationalist system. From an early age, Peter's education (commissioned by Tsar Alexis I) was put in the hands of several tutors, most notably Nikita Zotov, Patrick Gordon, and Paul Menesius. On 29 January 1676, Tsar Alexis died, leaving the sovereignty to Peter's elder half-brother, the weak and sickly Feodor III. Throughout this period, the government was largely run by Artamon Matveev, an enlightened friend of Alexis, the political head of the Naryshkin family and one of Peter's greatest childhood benefactors. This position changed when Feodor died in 1682. As Feodor did not leave any children, a dispute arose between the Naryshkin and Miloslavsky families over who should inherit the throne. Peter's other half-brother, Ivan V, was next in line for the throne, but he was chronically ill and of infirm mind. Consequently, the Boyar Duma (a council of Russian nobles) chose the 10-year-old Peter to become Tsar with his mother as regent. This arrangement was brought before the people of Moscow, as ancient tradition demanded, and was ratified. Sophia Alekseyevna, one of Alexis' daughters from his first marriage, led a rebellion of the Streltsy (Russia's elite military corps) in April–May 1682. In the subsequent conflict some of Peter's relatives and friends were murdered, including Matveev, and Peter witnessed some of these acts of political violence. By the summer of 1689, Peter planned to take power from his half-sister Sophia, whose position had been weakened by two unsuccessful Crimean campaigns. When she learned of his designs, Sophia conspired with the leaders of the Streltsy, who continually aroused disorder and dissent. Peter, warned by the Streltsy, escaped in the middle of the night to the impenetrable monastery of Troitse-Sergiyeva Lavra; there he slowly gathered adherents who perceived he would win the power struggle. She was eventually overthrown, with Peter I and Ivan V continuing to act as co-tsars. Peter forced Sophia to enter a convent, where she gave up her name and her position as a member of the royal family. "Tsar Peter was tall and thin, rather than stout. His hair was thick, short, and dark brown; he had large eyes, black with long lashes, a well-shaped mouth, but the lower lip was slightly disfigured ... For his great height, his feet seemed very narrow. His head was sometimes tugged to the right by convulsions." Few contemporaries, either in or outside of Russia, commented on Peter's great height or appearance. Peter the Great had two wives, with whom he had fourteen children; three of them survived to adulthood. His eldest child and heir, Alexei, was suspected of being involved in a plot to overthrow the Emperor. Alexei was tried and confessed under torture during questioning conducted by a secular court. He was convicted and sentenced to be executed. The sentence could be carried out only with Peter's signed authorization, and Alexei died in prison, as Peter hesitated before making the decision. Alexei's death most likely resulted from injuries suffered during his torture. Peter implemented sweeping reforms aimed at modernizing Russia. Heavily influenced by his advisors from Western Europe, Peter reorganized the Russian army along modern lines and dreamed of making Russia a maritime power. He faced much opposition to these policies at home, but brutally suppressed any and all rebellions against his authority: Streltsy, Bashkirs, Astrakhan, and the greatest civil uprising of his reign, the Bulavin Rebellion. Peter implemented social modernization in an absolute manner by requiring courtiers, state officials, and the military to shave their beards and adopt modern clothing styles. One means of achieving this end was the introduction of taxes for long beards and robes. To improve his nation's position on the seas, Peter sought to gain more maritime outlets. His only outlet at the time was the White Sea at Arkhangelsk. The Baltic Sea was at the time controlled by Sweden in the north, while the Black Sea was controlled by the Ottoman Empire in the south. Peter attempted to acquire control of the Black Sea; to do so he would have to expel the Tatars from the surrounding areas. As part of an agreement with Poland which ceded Kiev to Russia, Peter was forced to wage war against the Crimean Khan and against the Khan's overlord, the Ottoman Sultan. Peter's primary objective became the capture of the Ottoman fortress of Azov, near the Don River. In the summer of 1695 Peter organized the Azov campaigns to take the fortress, but his attempts ended in failure. Peter returned to Moscow in November of that year and began building a large navy. He launched about thirty ships against the Ottomans in 1696, capturing Azov in July of that year. On 12 September 1698, Peter officially founded the first Russian Navy base, Taganrog. Peter knew that Russia could not face the Ottoman Empire alone. In 1697 he traveled incognito to Europe on an 18-month journey with a large Russian delegation–the so-called "Grand Embassy"—to seek the aid of the European monarchs. Peter's hopes were dashed; France was a traditional ally of the Ottoman Sultan, and Austria was eager to maintain peace in the east while conducting its own wars in the west. Peter, furthermore, had chosen the most inopportune moment; the Europeans at the time were more concerned about who would succeed the childless Spanish King Charles II than about fighting the Ottoman Sultan. The "Grand Embassy", although failing to complete the mission of creating an anti-Ottoman alliance, continued. While visiting Holland, Peter learned much about life in Western Europe. He studied shipbuilding in Zaandam (the house he lived in is now a museum, the Tsar Peter house) and Amsterdam, where he visited, among others, the upper-class de Wilde family. Jacob de Wilde, a collector-general with the Admiralty of Amsterdam, had a well-known collection of art and coins, and de Wilde's daughter Maria de Wilde made an engraving of the meeting between Peter and her father, providing visual evidence of "the beginning of the West European classical tradition in Russia". According to Roger Tavernier, Peter the Great later acquired de Wilde's collection. Thanks to the mediation of Nicolaas Witsen, mayor of Amsterdam and expert on Russia, the Tsar was given the opportunity to gain practical experience in the largest shipyard in the world, belonging to the Dutch East India Company, for a period of four months. The Tsar helped with the construction of an East Indiaman especially laid down for him: Peter and Paul. During his stay the Tsar engaged many skilled workers such as builders of locks, fortresses, shipwrights, and seamen—including Cornelis Cruys, a vice-admiral who became, under Franz Lefort, the Tsar's advisor in maritime affairs. He later put his knowledge of shipbuilding to use in helping build Russia's navy. Peter paid a visit to Frederik Ruysch, who taught him how to draw teeth and catch butterflies. Ludolf Bakhuysen, a painter of seascapes and Jan van der Heyden the inventor of the fire hose, received Peter, who was keen to learn and pass on his knowledge to his countrymen. On 16 January 1698 Peter organized a farewell party and invited Johan Huydecoper van Maarsseveen, who had to sit between Lefort and the Tsar and drink. In England Peter met with King William III, visited Greenwich and Oxford, was painted by Sir Godfrey Kneller, and saw a Royal Navy Fleet Review at Deptford. He travelled to the city of Manchester to learn the techniques of city-building he would later use to great effect at Saint Petersburg. The Embassy next went to Leipzig, Dresden, and Vienna. He spoke with August the Strong and Leopold I, Holy Roman Emperor. Peter's visit was cut short in 1698, when he was forced to rush home by a rebellion of the Streltsy. The rebellion was, however, easily crushed before Peter returned home from England; of the Tsar's troops, only one was killed. Peter nevertheless acted ruthlessly towards the mutineers. Over 1,200 of the rebels were tortured and executed, and Peter ordered that their bodies be publicly exhibited as a warning to future conspirators. The Streltsy were disbanded, and the individual they sought to put on the Throne—Peter's half-sister Sophia—was forced to become a nun. Also, upon his return from his European tour, Peter sought to end his unhappy marriage. He divorced the Tsaritsa, Eudoxia Lopukhina. The Tsaritsa had borne Peter three children, although only one, the Tsarevich Alexei, had survived past his childhood. In 1698 Peter sent a delegation to Malta under boyar Boris Petrovich Sheremetyev, to observe the training and abilities of the Knights of Malta and their fleet. Sheremetyev investigated the possibility of future joint ventures with the Knights, including action against the Turks and the possibility of a future Russian naval base. Peter's visits to the West impressed upon him the notion that European customs were in several respects superior to Russian traditions. He commanded all of his courtiers and officials to cut off their long beards—causing his Boyars, who were very fond of their beards, great upset—and wear European clothing. Boyars who sought to retain their beards were required to pay an annual beard tax of one hundred rubles. He also sought to end arranged marriages, which were the norm among the Russian nobility, because he thought such a practice was barbaric and led to domestic violence, since the partners usually resented each other. Russia was ill-prepared to fight the Swedes, and their first attempt at seizing the Baltic coast ended in disaster at the Battle of Narva in 1700. In the conflict, the forces of Charles XII used a blinding snowstorm to their advantage. After the battle, Charles XII decided to concentrate his forces against the Polish-Lithuanian Commonwealth, which gave Peter time to reorganize the Russian army. At the end of February 1701 he met with Polish King Augustus II the Strong in Biržai, where the rulers, after several days of drinking, arranged a cannon shooting competition, won by the Polish King. As the Poles and Lithuanians fought against the Swedes, Peter founded the city of Saint Petersburg (Germanically named after Saint Peter the Apostle) in Ingermanland (province of Swedish empire, which he had captured) in 1703. He forbade the building of stone edifices outside Saint Petersburg, which he intended to become Russia's capital, so that all stonemasons could participate in the construction of the new city. He also took Martha Skavronskaya as a mistress. Martha converted to the Russian Orthodox Church and took the name Catherine, allegedly marrying Peter in secret in 1707. Peter valued Catherine and married her again (this time officially) at Saint Isaac's Cathedral in Saint Petersburg on 9 February 1712. 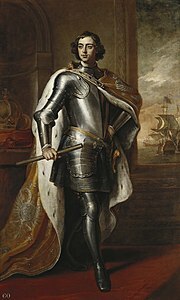 Following several defeats, the Polish King August II abdicated in 1706. Swedish king Charles XII turned his attention to Russia, invading it in 1708. After crossing into Russia, Charles defeated Peter at Golovchin in July. In the Battle of Lesnaya, Charles suffered his first loss after Peter crushed a group of Swedish reinforcements marching from Riga. Deprived of this aid, Charles was forced to abandon his proposed march on Moscow. Charles XII refused to retreat to Poland or back to Sweden, instead invading Ukraine. Peter withdrew his army southward, destroying along the way any property that could assist the Swedes. Deprived of local supplies, the Swedish army was forced to halt its advance in the winter of 1708–1709. In the summer of 1709, they resumed their efforts to capture Ukraine, culminating in the Battle of Poltava on 27 June. The battle was a decisive defeat for the Swedish forces, ending Charles' campaign in Ukraine and forcing him into exile in the Ottoman Empire. In Poland, August II was restored as King. Peter, overestimating the support he would receive from his Balkan allies, attacked the Ottoman Empire, initiating the Russo-Turkish War of 1710. Normally, the Boyar Duma would have exercised power during his absence. Peter, however, mistrusted the boyars; he instead abolished the Duma and created a Senate of ten members. Peter's campaign in the Ottoman Empire was disastrous, and in the ensuing peace treaty, Peter was forced to return the Black Sea ports he had seized in 1697. In return, the Sultan expelled Charles XII, but Russia was forced to guarantee safe passage to the Swedish king, who in the end traveled back to Sweden through Germany. Peter's northern armies took the Swedish province of Livonia (the northern half of modern Latvia, and the southern half of modern Estonia), driving the Swedes into Finland. In 1714 the Russian fleet won the Battle of Gangut. Most of Finland was occupied by the Russians. In 1716 and 1717, the Tsar revisited the Netherlands, and went to see Herman Boerhaave. He continued his travel to the Austrian Netherlands and France. The Tsar's navy was so powerful that the Russians could penetrate Sweden. Peter also obtained the assistance of the Electorate of Hanover and the Kingdom of Prussia. Still, Charles XII refused to yield, and not until his death in battle in 1718 did peace become feasible. After the battle near Åland, Sweden made peace with all powers but Russia by 1720. In 1721 the Treaty of Nystad ended what became known as the Great Northern War. Russia acquired Ingria, Estonia, Livonia, and a substantial portion of Karelia. In turn, Russia paid two million Riksdaler and surrendered most of Finland. The Tsar retained some Finnish lands close to Saint Petersburg, which he had made his capital in 1712. During Peter's reign the Russian Orthodox Church was reformed. The traditional leader of the Church was the Patriarch of Moscow. In 1700, when the office fell vacant, Peter refused to name a replacement, allowing the Patriarch's Coadjutor (or deputy) to discharge the duties of the office. In 1721 Peter followed the advice of Feofan Prokopovich and created the Holy Synod, a council of ten clergymen, to take the place of the Patriarch and Coadjutor. Peter implemented a law that stipulated that no Russian man could join a monastery before the age of 50. He felt that too many able Russian men were being wasted on clerical work when they could be joining his new and improved army. In 18th-century Russia, few people lived to over a half century; therefore very few men became monks during Peter's reign, much to the dismay of the Russian Church. In 1722 Peter created a new order of precedence known as the Table of Ranks. Formerly, precedence had been determined by birth. To deprive the Boyars of their high positions, Peter directed that precedence should be determined by merit and service to the Emperor. The Table of Ranks continued to remain in effect until the Russian monarchy was overthrown in 1917. Peter decided that all of the children of the nobility should have some early education, especially in the areas of sciences. Therefore, on 28 February 1714, he issued a decree calling for compulsory education, which dictated that all Russian 10- to 15-year-old children of the nobility, government clerks, and lesser-ranked officials, must learn basic mathematics and geometry, and should be tested on it at the end of their studies. In 1724 Peter had his second wife, Catherine, crowned as Empress, although he remained Russia's actual ruler. All of Peter's male children had died—the eldest son, Alexei, had been tortured and killed on Peter's orders in 1718 because he had disobeyed his father and opposed official policies. Alexei's mother Eudoxia had also been punished; she was dragged from her home and tried on false charges of adultery. A similar fate befell Peter's mistress, Anna Mons, in 1704. In 1725 construction of Peterhof, a palace near Saint Petersburg, was completed. Peterhof (Dutch for "Peter's Court") was a grand residence, becoming known as the "Russian Versailles". Erekle I of Kakheti, Georgian king who is claimed to be a natural father of Peter the Great. ↑ Riasanovsky, Nicholas (2000). A History of Russia. Oxford: Oxford University Press. p. 214. ↑ Riasanovsky, Nicholas (2000). A History of Russia. Oxford: Oxford University Press. p. 218. ↑ Riasanovsky, Nicholas (2000). A History of Russia, sixth edition. p. 216. ↑ 6.0 6.1 Hughes, John R. (2007). "The seizures of Peter Alexeevich". Epilepsy & Behavior (10:1). pp. 179–182. ↑ Massie, Robert K. (1980). 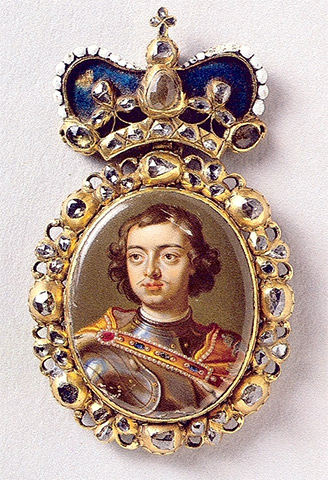 Peter the Great, His Life and Real World. New York: Alfred A. Knopf. pp. 76,377,707. ISBN 978-0-307-29145-5. ↑ Riasanovsky, Nicholas (2000). A History of Russia, sixth edition. p. 221. ↑ Abbott, Peter (1902). "Peter the Great". Project Gutenberg online edition. http://www.gutenberg.org/files/21889/21889-h/21889-h.htm. ↑ Riasanovsky, Nicholas (2000). A History of Russia, sixth edition. p. 218. ↑ Wes, Martinus A. (1992). Classics in Russia, 1700–1855: Between Two Bronze Horsemen. Brill. p. 14. ISBN 978-90-04-09664-6. http://books.google.com/books?id=N9wviNiWb0EC&pg=PA14. ↑ Tavernier, Roger (2006). Russia and the Low Countries: An International Bibliography, 1500–2000. Barkhuis. p. 349. ISBN 978-90-77089-04-0. http://books.google.com/books?id=0RMoRvbo-d8C&pg=PA349. ↑ Farquhar, Michael (2001). A Treasure of Royal Scandals, p.176. Penguin Books, New York. ISBN 0-7394-2025-9. ↑ Riasanovsky, Nicholas (2000). A History of Russia, sixth edition. p. 220. ↑ "Russian Grand Priory — Timeline". 2004. http://www2.prestel.co.uk/church/oosj/timeline.htm. Retrieved 9 February 2008. ↑ O.L. D'Or. "Russia as an Empire" (PHP). The Moscow News weekly. pp. , Russian. http://english.mn.ru/english/issue.php?2002-46-3. Retrieved 21 March 2008. ↑ Oudard, Georges; Atkinson, Frederick (translated) (1929). Peter the Great. New York: Payson and Clarke. p. 197. ↑ Staszewski, Jacek (1998). August II Mocny. Wrocław: Zakład Narodowy im. Ossolińskich. p. 120. ↑ 20.0 20.1 20.2 Riasanovsky, Nicholas (2000). A History of Russia, sixth edition. p. 224. ↑ Bain, R. Nisbet (1905). "Peter the Great and his pupils". Cambridge University. http://history.wisc.edu/sommerville/351/CMHPeter.html. Retrieved 9 February 2008. Bushkovitch, Paul A. (January 1990). "The Epiphany Ceremony of the Russian Court in the Sixteenth and Seventeenth Centuries". pp. 1–17. Digital object identifier:10.2307/130080. JSTOR 130080. http://www.jstor.org/stable/130080.